Agnes of the Palatinate (1201–1267) was a daughter of Henry V, Count Palatine of the Rhine and his first wife Agnes of Hohenstaufen, daughter of Conrad, Count Palatine of the Rhine. Agnes was Duchess of Bavaria by her marriage to Otto II Wittelsbach, Duke of Bavaria. Agnes' paternal grandparents were Henry the Lion and his second wife Matilda of England. Matilda was a daughter of Henry II of England and his celebrated queen Eleanor of Aquitaine. Henry II was son of Geoffrey Plantagenet, Count of Anjou and his wife Matilda of the English. Agnes was the youngest of three children born to her father by both of his marriages. Her father's second wife, also called Agnes, was the daughter of Conrad II, Margrave of Lusatia. 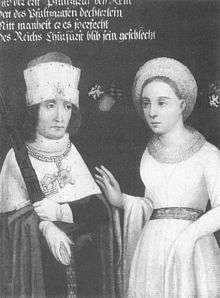 Agnes' older sister was Irmgard, wife of Herman V, Margrave of Baden-Baden and her brother was Henry VI, Count Palatine of the Rhine. Agnes married Otto II at Worms when he came of age in 1222. With this marriage, the Wittelsbach family inherited Palatinate and kept it as a Wittelsbach possession until 1918. Since that time also the lion has become a heraldic symbol in the coat-of-arms for Bavaria and the Palatinate. In 1231 upon the death of Otto's father, Louis I, Duke of Bavaria, Otto and Agnes became Duke and Duchess of Bavaria. After a dispute with Emperor Frederick II was ended, Otto joined the Hohenstaufen party in 1241. Their daughter, Elizabeth, was married to Frederick's son Conrad IV. Because of this, Otto was excommunicated by the pope. Louis II, Duke of Bavaria (13 April 1229, Heidelberg – 2 February 1294, Heidelberg). Henry XIII, Duke of Bavaria (19 November 1235, Landshut – 3 February 1290, Burghausen). 1259 in Munich to Count Meinhard II of Gorizia-Tyrol, Duke of Carinthia. Sophie (1236, Landshut – 9 August 1289, Castle Hirschberg), married 1258 to Count Gerhard IV of Sulzbach and Hirschberg. Agnes (c. 1240–c. 1306), a nun. Otto died 29 November 1253. Agnes died fourteen years later in 1267. She is buried at Scheyern.